Green architecture, which includes some of the most innovative projects being built today, presents some of the paramount energy saving solutions available to a planet entering a post-consumer era. 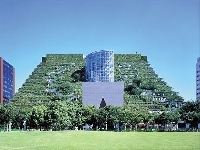 Green structures are being designed with an ever increasing sensitivity toward the environment. These buildings are energy-efficient, resource-efficient, sustainable, economical and non-polluting. From solar powered dwellings to underground homes to green-roofed corporate offices; some of these new structures are entirely "off the grid", generating more power than they actually use. In a dramatically changing world, we must look to our architects, engineers, builders and contractors to develop and implement new technologies for energy saving at home as well as improve upon outdated technologies. As consumers in this shifting world, we are constantly faced with making lifestyle decisions that can drastically impact our environment. One of the most momentous lifestyle decisions we can make is the type of home we choose to live in. Although radical solar powered or geodesic houses may be out of the question for many of us, there are still many simple energy saving solutions that can help to slash utility bills, and lessen the environmental impact of our residential and commercial buildings. Why not start small by replacing appliances in your home with a more energy efficient version. One of the best ways to reduce your energy bill is by installing a solar air heater. Here are some tried and true web resources for those seeking to undertake green projects or implement energy saving at home. The U.S. Green Building Council is a non-profit organization features information and resources pertaining to green building. Their website features case studies, project profiles, industry news and events, information on LEED certification and much more. The U.S. Department of Energy currently offers many tax credits, rebates and incentives for energy upgrades to homes. The American Recovery and Reinvestment Act of 2009 extended many of these consumer tax incentives originally introduced in the Energy Policy Act of 2005. ENERGY STAR is a joint program of the U.S. Environmental Protection Agency and the U.S. Department of Energy. The ENERGY STAR website offers lists of certified energy saving appliances, information on tax credits and rebates for these products, as well as guidelines for ENERGY STAR building, remodeling and home improvement. The American Institute of Architects offers a plethora of information on green design and sustainability. Their website features lists of award winning green projects, employment opportunities for green builders, resources for finding architects and more.